The course starts simply with students learning to touch-type, read and spell the vowels “a , e , i , o , u” . 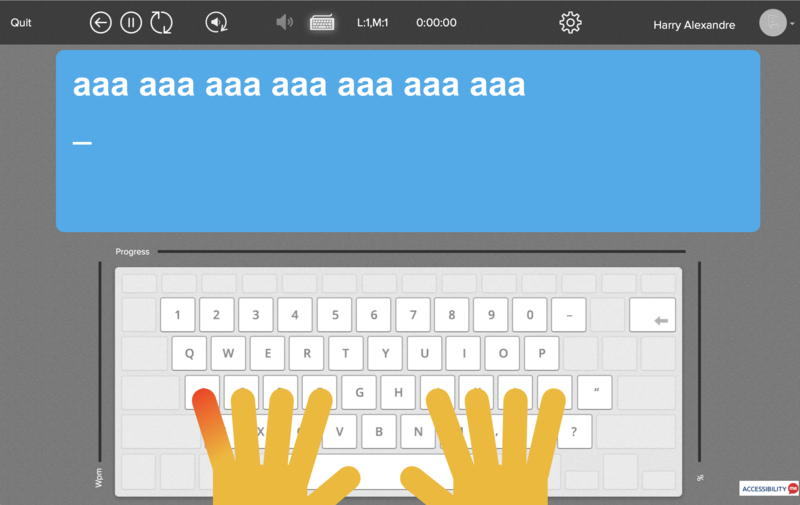 An audio track accompanies the letters as they appear on screen, helping reinforce sound-letter correspondence, which is a crucial skill for sounding out words in reading. The student then receives their first score – and success! The student is introduced to their first words through "onset and rime". For example - fed, wed, led. This teaches phonics in context and at the same time the student is learning how to touch-type. With repetition, these words move from short-term to long-term memory. Repetition also reinforces the touch-typing and in the case of TTRS - the spelling of words. Every 5th module is a dictation module that removes the visual element encourages the student to listen to the words and then type out what they hear. This reinforces the new words learned from the previous 4 modules. Tip: On a dictation module, press number 2 on the keyboard to repeat a word, or number 5 to show the word temporarily on the screen. Encourage students to take their time on these modules as they contain letters that can be tricky to type. Accuracy is more important than speed! 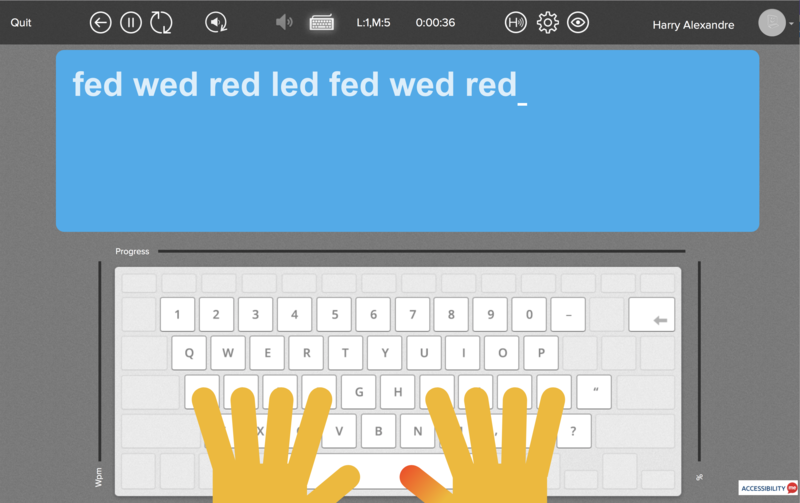 Halfway through this module, two fingers will be highlighted on the moving hands as capital letters are introduced using the shift keys. Students need to listen carefully to the instructions provided as this can be a difficult exercise. 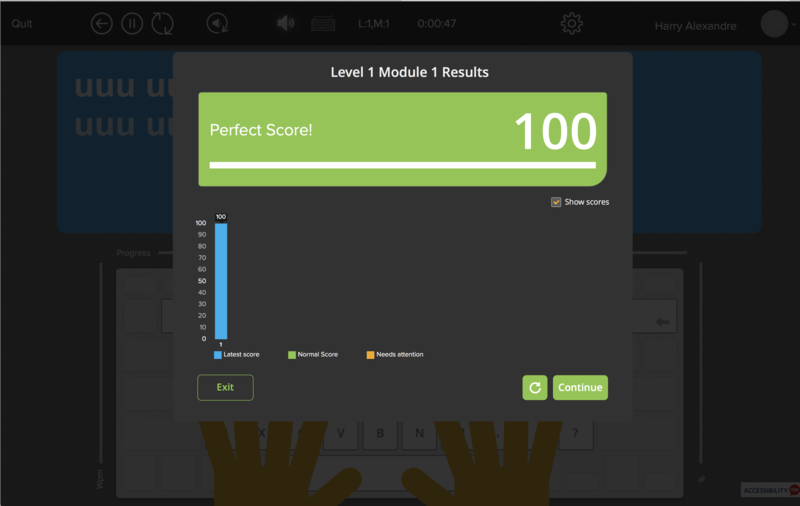 By the end of the second dictation module, the student can already touch-type, read, and spell their first sentence, with a capital letter and full stop. Sam hid the rod.